DJM Race Engineering took on the second round of the Australian Kart Championship at the Newcastle Kart Club over the weekend. With four seasons in a weekend with pouring rain to sunny conditions the team was in for a challenging weekend. With only two drivers making the journey to Newcastle in Cadet 9 driver Cooper Stapleton and KA2 driver Zaiden Barry the team were in for a tough weekend. Qualifying was meant to come around on Saturday morning but due to the high amount of rain part of the Newcastle Kart circuit was under water and there was a two-hour delay in proceedings. Due to the large delay qualifying was effectively cancelled and positions were decided from timed practice that was done on Friday. Due to this Stapleton was starting on the inside of the second row in third for the heats while Barry didn’t have the best session putting him out of position twenty-six for the heats. In the opening heats Stapleton was right in the thick of the action in the front group battling for position and race victories. Stapleton crossed the line in heat 1 and took victory before a drop-down nosecone penalty dropped him to position three. In heat 2 Stapleton was again in the battle and came home inside the top three in third before another drop down nosecone penalty dropped him down to position five. Barry in his open heat battled from his starting position before coming home in position twenty-six where he started from. Barry then had an unfortunate DNF in heat 2 when he spun off the circuit under one of the full course yellows putting him back with work to do. In heats 3 and 4 Stapleton was again right in the battle in the front group starting inside the top five. Stapleton got shuffled back a little bit coming home in position six in the third heat. Stapleton was unfortunately involved in a first corner incident in heat 4 but in a mega fight back he manage to get up into the top five finishing fifth and setting the fastest lap of the race on his charge back through the field. Barry due to his DNF in heat 2 started out of position twenty-nine for heat three. In heat three and four Barry was able to come slightly forward coming home in position twenty-seven in heat three and twenty-eight in heat 4. In the final Stapleton got away cleanly settling into second spot in the earlier stages and looking a chance to really take it to the race leader. Stapleton unfortunately did quiet have the pace to go with the leaders and dropped back a few spots finishing just outside the top five in sixth spot. Barry had his best race of the weekend by a long way charging forward in the final coming home in position seventeen for his best result of the weekend. DJM Race Engineering Team Owner Dylan McLellan was happy with Stapleton’s consistency over the weekend and Barry’s improvement. 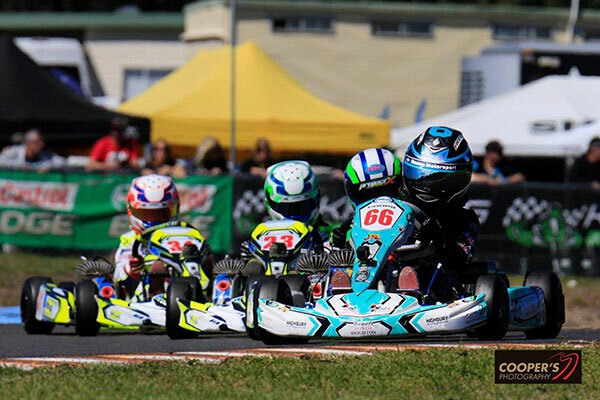 “Cooper did a great job over the weekend, its very tough to run up the front at the Australian Kart Titles. To miss the top five was frustrating but we gathered great points and are still right in the championship hunt. Zaiden never being to the track had us behind the rest but his final was a great result for a tough weekend”. DJM Race Engineering will be again at the track this weekend at the second round of the Golden Power Series at Albury Wodonga.